· Record “Description” for your Project. · “Next Steps” provides forward compatibility with CRM Project form. 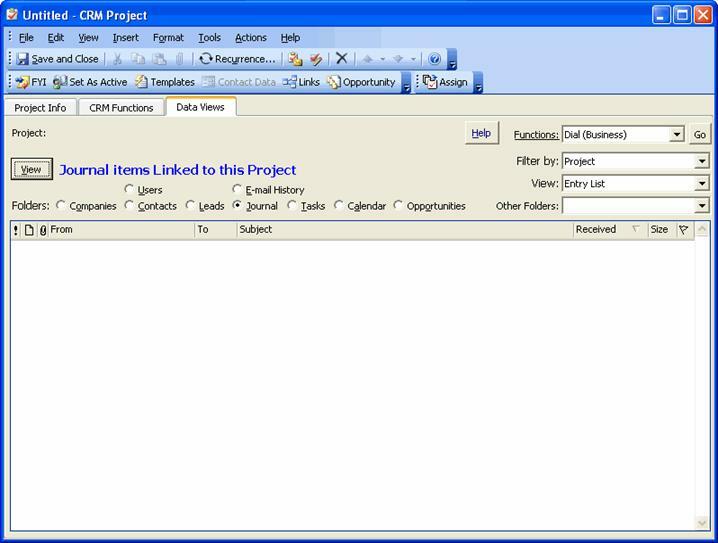 · Set Link to your “Project Plan” document or MSProject file. · Enhanced Project Management for CRM. · “Project Stage” and “Project Status” changes are automatically tracked in the “History” log with Date, User Name, and User Notes. · “Revenue Date” is supported in addition to “Close Date” to keep your CFO happy. · “Partner” is hyperlinked when the partner name exists in the CRM companies or contacts. Display the CRM Project Manager with this Project. 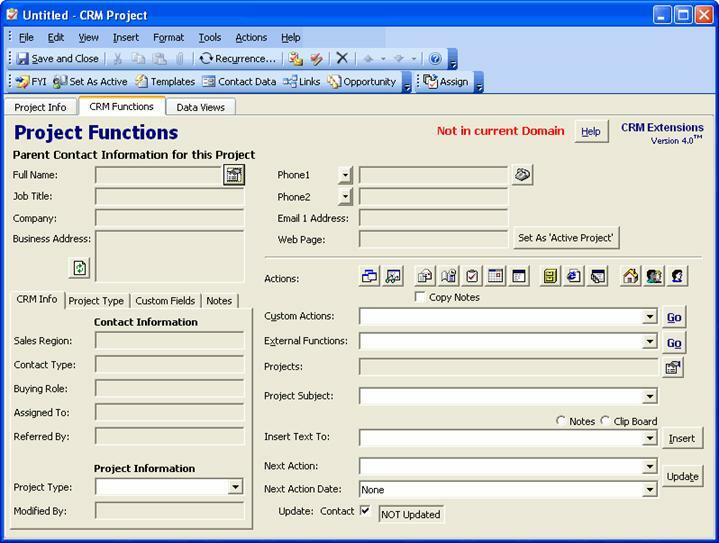 · “CRM Functions” options are set on the CRM Options “Extensions Projects” tab. 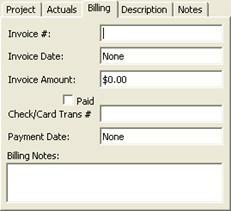 · CRM “Account Manager” information is clearly visible when working with all of your Projects. 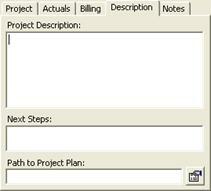 · Use Templates to set standard “Action Plans” (processes) for working this Project. 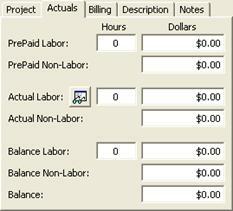 · Standard Project Start / Due Dates, Projected hours & Percent Complete. · Staffing and “M-Days Remaining” are auto-calculated for you. · “Estimated Completion Date” is autocalculated from “Last Status Date” with “M-Days Remaining”. Option to exclude weekends in “Est. Completion Date” calculation. · “Actual” Labor and non-Labor auto cumulate from “Billable” Journals that have been recorded to this Project. · Record any specific Project “Notes” (5th mini-tab in middle of form above). · Attach documents, pictures and formatted text notes. · The “CRM Functions” tabs are designed to provide – right on the form – all of the critical CRM type functionality that is relevant when working with an CRM form. · Conveniently located on each of the Extensions forms to save time and eliminate clicking around to find the functions you need. Most features and functions are only one or two clicks away. · The layout and features of each of the “CRM Functions” tabs on each of the different Extensions forms are identical to reduce the learning curve, simplify “CRM” type tasks and speed up the usage of the CRM system (convenience and speed!). · Each of the fields and functions operate the same, but on the Project form they are for the Project and the linked Contact (on a Journal they would be for the Journal and its linked Contact, etc.). · May link this Opportunity to a different CRM Contact (pick button). · Launch the Outlook Phone Dialer for the linked contact (phone button). · Display linked CRM Contact and Company (by clicking on the labels). · Update linked Contact information in this Opportunity (“Update Info” button). · Settings for this block of tabs may be set to be the same as your Extensions Contact form, or they may be unique to the Opportunity. · “Created By / Date” and “Modified By / Date” values are tracked. · View any of the linked Contact phone numbers. · View / Open all Projects (and Opportunities) that are linked to this Project. · Link additional Projects (and Opportunities) to this Project (pick button). · Select from a list of standardized Subjects for this Opportunity. Variables are supported for dynamic field substitution in the Subject text. · “Insert Text” with templates to standardize notes. These templates are inserted into the “Notes” field on the first tab. Variables are supported for dynamic field substitution in the template. · Specify the “Next Action” and “Next Action Date” for this Project. Option may be set to automatically update “Next Action” in the linked Contact. · Quick access to specific CRM information related to this Project (Journals, Tasks, Appointments, etc.). · Filter the displayed list by this Project or the linked Contact or the contact’s Company. · View the information with Outlook Views that have been created in the corresponding CRM public folder. Display any field, four levels of sorting and grouping, etc. (Ex. Clicking “Calendar” will display all Appointments related to this Project). · “Other Folders” provides visibility of related TeamWork WorkFlow items in any of your TeamWork folders or other folders you may have added to your CRM configuration (ex. “Portfolios”, “Inventory”, “Tickets”, etc.). · These Views are dynamically user configurable right on this form just as with views in any Outlook folder (click a column title to sort, drag/drop grouping, add fields, etc.). · Double click any row in the display to open the specific CRM item. · Perform “mass edits” for displayed items by dragging/dropping between displayed groups. · “CRM Functions” options are set on the CRM Options “Extensions General” tab.